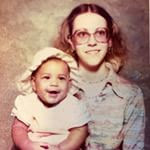 Me and my mother Deborah, circa 1977. The boundaries of my childhood world were marked by our apartment on Chestnut Street, my elementary school around the corner, and the public library in the other direction. We existed within a few block radius, rarely venturing outside, except for when a school bus came early every Sunday morning to our inner city neighborhood to deliver us to a suburban church, where we unsaved poor people were offered salvation among the middle class. One day, a friend invited me to play at her house after services, and when I saw her charming home on a tree-lined street, I realized not everyone lived in crumbly apartments infested with roaches. At dinner we ate fresh green beans. I didn’t even know you could buy green beans that weren’t in a can. I started to wonder about what else was out there that I didn’t know about. Luckily, Reading Rainbow and my teacher Mrs. Iannucello ingrained in my young mind that books have answers, so I spent hours at the library reading my way through the children’s section and eventually into the young adult section. I always won the summer reading challenge, which sounds like an accomplishment and maybe it was, but really, I didn’t have much else to do besides devour books. In hindsight I can’t complain, because I honestly believe that I would have grown up to be a very different person if I wasn’t lucky enough to have that library within walking distance. The library encouraged me to envision the possibility of staking a greater claim for my space in the world. By reading print on a page, I could go anywhere and be with anybody. I jumped over puddles withRamona and Beezus on a rainy day on Klickitat street in Portland, Oregon, and learned about being a kid growing up in a two parent home three thousand miles away from where I lived with a single mom. I cried when Charlotte died and reflected on the meaning of friendship, even though I had not yet experienced the death of anyone close to me. I stayed up past my bedtime savoring adolescent heartbreak penned by Judy Blume, and felt a little less worried about my new school where not only would I be the new kid, I’d also be the kid who didn’t look like anyone else. A handful of books I read over and over, and looking back, I credit them with helping to shape my worldview and willingness to learn about different cultures. Around the third grade, the librarian introduced me to an old series of books, with bent down page corners and tattered spines, that I checked out a half dozen times over the next couple of years: All-of-a-Kind Family, the tale of five Jewish-American sisters growing up in a crowded tenement in an immigrant neighborhood in early 1900s New York City. Coming from a strict Christian community, with no tangible point of reference for Judaism, my mind grew bigger as I learned about beautiful traditions like Shabbat and Succot, kugel, the Torah, and how Jewish immigrants experienced daily life as they became part of American society. I also reveled in the sisters making mischief and their adventures together, because what kid doesn’t love mischief and adventures? With each rereading, they became more like friends, imaginary of course, but still delightful. In middle school, after I read The Diary of Anne Frank, I remember shutting the book deep inside a drawer, as if trying to push Anne’s truth away from me. I struggled to fathom how such atrocity and inhumanity was allowed to happen in such relatively recent history. I thought about the All-of-a-Kind sisters and understood immediately that the innocent people killed in concentration camps were just like them — the sisters and Anne Frank were Jewish. And although I and my family are not, I recognized still that we cared about our families and friends in the same way, and we all wanted to grow up to do great things. We shared common ground. I understood we were more alike than we were different as young girls trying to navigate the world. To this day, I carry that understanding with me as a lens through which I view my relationships with others who come from different backgrounds. Today I am far away from Chestnut Street and the boundaries of my world growing up. I’ve journeyed to a few distant places, met many fascinating people, and felt the thrill of new experiences. Yet sometimes, I am confronted with an interaction that is outside my comfort zone and I feel fear or distrust creeping in. When that happens, I remember the little girl sitting on the library floor surrounded by stacks of books, who craved knowledge and wanted to meet all the different kinds of people in the world. And I honor her memory by looking first for common ground. This entry was posted on June 22, 2015 by janeewoods and tagged Scenarios USA.